This is where the characters are made! students learn the crafts of modeling and rigging. Rigging students place bones into the body to bend it properly and control the shape of the form in the myriad of possible poses. Each week, modelers and riggers (Character TDs) from film and game studios work with the students one-on-one, giving the students a guided opportunity for improving their own work. Once a design has been sketched on paper, modeling students sculpt them in 3D. It not only has to look beautiful, but the arrangement of points and edges also have to facilitate the next step: articulation. That’s where rigging steps in. 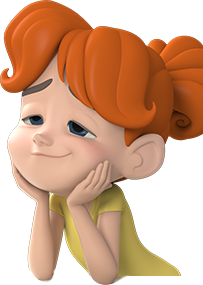 Our 3D Character program is divided into 2 parts, the 3D Character track, and the 3D Character program. The 3D Character track consists of classes 0-3. 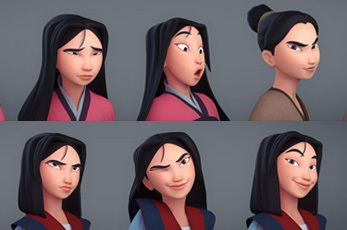 In the 3D Character track, students focus on modeling and rigging. 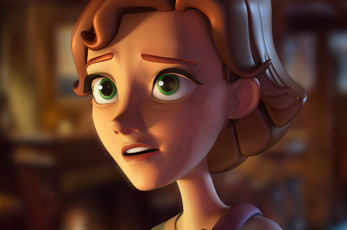 In classes 4-7, our 3D Character Program, 3D Character students focus more specifically on their area of greater interest, selecting two of Five electives covering the technical, tools side of rigging, or the sculpting and facial expression side of modeling, Environments, Materials and Texturing, or Lighting. 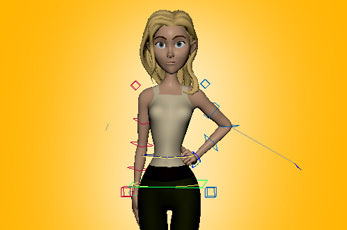 Prior to acceptance in the 3D Character program students must successfully complete the 3D Character track classes or provide the Review Board with a reel demonstrating the prerequisite skills needed to be successful in the 3D Character Program. Each term in the 3D Character Track and Program is 11 weeks long. Learn the skills used to make 3D characters for feature films, tv productions, vr and video games. 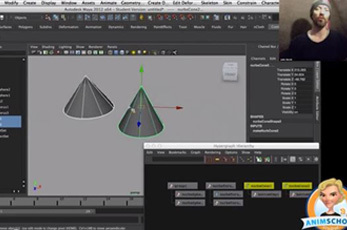 Learn the basics of Maya: the Maya interface, working with objects, modeling basics, how to animate objects, apply textures, and use lights and cameras to render your scene. 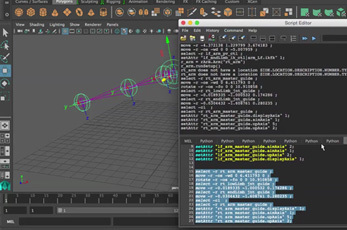 Students with Maya experience can bypass this course. This course is offered at a lower tuition cost than all other courses. Introduction to the principles of polygon/subdivision surface and other modeling formats, applied to simple objects. This class teaches topology layouts in theory and practice, achieving desirable shaping, modeling workflows, and the best rest state for rigging. Students model organic and inorganic objects, model a designed vehicle, and a designed character bust. Students learn basic modeling concepts, working with manipulators, isolate selection, primitives, history, loft, bevel, extrusion, duplication, transformation space, soft selection, reflection editing, lattices, converting geometry types, projects, and workspace. Introduction to the principles of rigging, applied to simple objects. 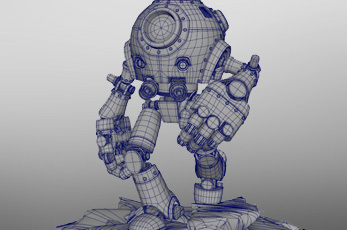 Students use their modeling assignment to learn basic rigging concepts, including hierarchies, constraints, skinning, blendshapes, connections, joints, orientation, inverse kinematics, expressions, math operators, xray, curve controls, custom attributes, sets, Set Driven Keys, and hypergraph connections. 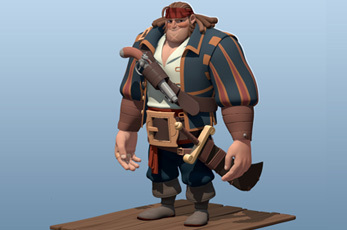 Students use the polygon/subdivision-surface modeling tools to make a character model based on a chosen character design. Areas of focus are bodies and hands. Students learn the best practices for modeling an entire character in a hero pose, searching for appeal as well as technical integrity. Through iterations and direction from the instructor, the students refine the shapes for maximum appeal and usability. Concepts such as normals, UV texture projections, and smoothing are discussed. Students use the rigging concepts they’ve learned to place joints into their character model and apply smooth skinning. This course teaches body rigging. Rigging controls like forward/inverse kinematics, twisting, and world/local constraints are added for ease of use during posing. Then shapes and customizations are applied to refine deformations. Concepts such as multiplier attributes, lattices, wrap, nonlinear, and wire deformers, beginning Python scripting, and gimbal avoidance are covered. Introduction to the principles of animation, applied to simple objects and scenarios. 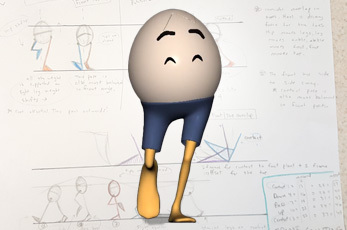 Students animate with balls of different weight, a tow truck, and hips & legs of a simple character to learn about timing, arcs, spacing, ease in and out, weight, gravity, drag, secondary action, overlap, follow through, squash and stretch, and exaggeration. Students learn software concepts such as projects, workspace, AutoKey keyframing, hotkeys, graph editor editing, tangents, curve cycling, and playblasting. Students learn facial rigging techniques that will help them break up facial articulation into the most usable set of functions and shapes. Students take their deformation work to a higher level of refinement, and develop their grasp of complex rigging issues. Students learn how computation speed and performance requirements affect the decision-making when a rig approach is considered. Difficult problems are tackled, such as shoulder deformation, clothing, user interfaces, rigging automation, and scripting. Students learn how to use ZBrush software, sculpting a character from a design. NOTE: This course requires the purchase of the student version of ZBrush, typically $450. Students learn the process of topologizing a dense sculpted mesh into a usable 3D model in Maya. Students learn the best modeling work-flow and practices in order to make appealing characters. Students tackle advanced facial modeling and learn the landmarks including: how to evaluate a model from multiple vantage points, how to simplify lines, what to look for to reveal model problems. Students also model a hard surface object or set piece for their character. 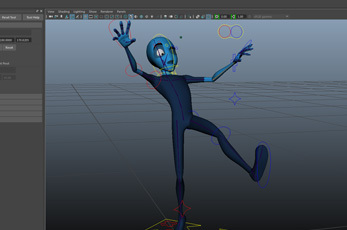 Modern rigging does not rely on hand-making rig parts for each character. Auto-rigging scripts and tools make many tasks easy. They take data like input positions and number of spine joints needed and then build a control rig in a few mouse clicks. With the control rig built, optimally, Character TD’s spend most of the rigging effort per character on the deformation rig. Building those tools and modifying them for a production’s needs is a large part of the rigging process. This requires a Rigger/Character TD be proficient at scripting languages. Now it's time to place your characters into a set! Learn how to make buildings, interiors, exteriors, and set pieces. Use rhythm and style to make your sets shine. Learn the secrets of set modeling, with instruction in UV's, Cloth simming and particle distribution of elements. Learn studio pipeline needs: Asset Management, Previs, Cameras and Lights. Cinematic Lighting Principles in both real world and CG applications. 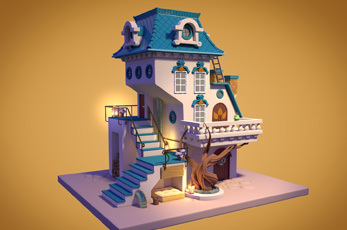 Learn the basics of 3D lighting in Maya from working pros, in live classes. Learn the principles of light, shadow, color, composition, and staging. How to render great images using Maya's tools. This course is designed for animation or modeling students, and also for students who may want to pursue lighting and rendering as a career path.